A beautiful candy buffet can be achieved at many different price levels so your first step is to lay down a budget. An intimate home family reception usually requires a smaller set up than one held in a reception hall. A reception held for 300 guests as opposed to 100 will also have an impact on the magnitude of your candy buffet. Keep in mind these factors while starting to work on the different phases of creating your candy buffet. Finding the size of the table you will be using to set the buffet will help you figure out the amount of jars that you will need. The larger the surface of the table is, the more jars and candies you will require. Depending of the size of the table, you can either offer a wider variety of candies using many smaller jars, or a smaller variety of candies in greater quantities in larger glass jars. Make inventory of glass jars, vases, cake trays, or any other interesting type of containers that you already have and could be used for the candy buffet. Ask your family or friends if they have some you could borrow. Prepare a list of what you are missing to know exactly what you need to buy. 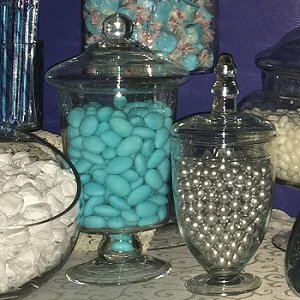 Refer to our tips on ‘Candy Buffet - How Much Candy Do You Need to Fill Glass Jars’ to make sure the size and the quantity of your glass jars are appropriate for the number of guests. If all is good, test the setting of your containers including decorative items on a surface size table similar to the one at the reception venue. Are you happy with the overall look? Experiment with the setting, using risers if necessary, until you find a combination that is not only attractive but functional as well. Are you working with a specific style or colour theme for your venue? Start selecting your favorite sweets according to your choice of colours, assigning each candy to a specific jar. Once your list is completed, refer to our tips on ‘Candy Buffet – How Much Candy You Need to Buy’ to find out the exact quantity of each type of candy you’ll need. To personalize the setting, don’t miss our tips on ‘Candy Buffet – The Final Touch’ where you will also find information on scoops, tongs, and serving containers. With our tips on Candy Buffet – Money Saving Tips’ find how you can easily reduce the cost of your candy buffet.